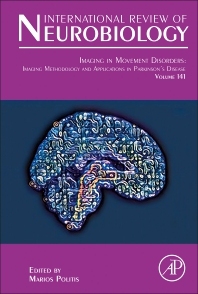 Imaging Methodology and Applications in Parkinson's Disease, Volume 141, provides an up-to-date and comprehensive textbook on the use of imaging modalities across the spectrum of movement disorders and dementias. Over the last decades, advances in neuroimaging tools has played a pivotal role in expanding our understanding of disease etiology and pathophysiology, identifying biomarkers to monitor disease progression, aiding differential diagnosis, and in the identification of novel targets for therapeutic intervention. This book brings together lessons learned from neuroimaging tools in movement disorders, including chapters on Advances in PET Methodology, Advances in MRI Methodology, Advances in SPECT Methodology, Hybrid PET/MRI Methodology, and more. Professor Marios Politis (MD MSc DIC PhD FRCP FEAN) is a Professor of Neurology & Neuroimaging, Consultant Neurologist, and the Director of Neurodegeneration Imaging Group at King’s College London and King’s College Hospital. He is a Visiting Professor at University of Exeter Medical School. His research involves the use of molecular (PET), functional (fMRI) and structural imaging as a method of investigating aetiology, pathophysiology, and effects and complications of novel therapies in Neurodegenerative disorders. His high-quality research has led to a body of scientific work investigating the pathophysiology of movement disorders such as Parkinson’s and Huntington’s disease and to publications in high impact scientific journals including Nature, Lancet, and Science journals, and also in the Journal of Clinical Investigation, Annals of Neurology, Brain, Neurology and JAMA Neurology. Professor Politis is a recipient of fellowships from and grant project awards from the Michael J Fox Foundation for Parkinson’s research, CHDI Foundation, Medical Research Council, European Union, Lily and Edmond J. Safra Foundation, Parkinson’s UK, National Institute of Health Research UK, Biomedical Research Centre UK and Alzheimer’s Disease Association UK. Professor Politis graduated in Medicine from the University of Athens, Greece, and he obtained an MSc and the Diploma of Imperial College in Integrative Neuroscience. He holds a PhD in Clinical Neuroscience from Imperial College London. He has previously worked as a clinical research fellow at University College London (UCL) and Imperial College London. He is a former Research Investigator of Hammersmith’s’ Cyclotron PET Unit. Before moving to King’s College London, he was an Academic Principal Investigator in the Neurology Imaging Unit at Imperial College London. He has significant industry experience by serving as a clinical investigator, consultant and principal investigator in several collaborations with industrial partners and pharma including a number of clinical trials. He has achieved a high number of awards and distinctions including the Movement Disorder Society Award for Outstanding and Innovative Clinical Research in 2012. In 2010, his PET imaging work in transplantation of foetal ventral mesencephalic tissue in Parkinson’s Disease patients was classed as one of the most important research achievements of MRC-funded research. He has received for four years in a row (2013-2016) the IMPETus award for innovative and outstanding PET molecular imaging research. In 2015, he received the PET Investigator Award from the Society of Nuclear Medicine and Molecular Imaging. In 2016, he was elected as Fellow of the European Academy of Neurology for outstanding contribution in neurodegenerative research. In 2017, he received the Jon Stolk Award in Movement Disorders from the American Academy of Neurology, and was elected Fellow of Royal College of Physicians. Professor Politis serves in the Scientific Advisory Board for the Movement Disorders Society, World Congress on Controversies in Neurology, the International Congress on Vascular Dementia, the International Congress on Non-Motor Dysfunctions in Parkinson's Disease and Related Disorders, Neurodegenerative Disease Research European Union Imaging committee, the Norwegian funding for Dementia, the Michael J Fox Foundation neuroinflammation consortium for Parkinson’s disease, the Alzheimer’s Research UK Network, and the Scientific Oversight Panel of the State University of New York. Professor Politis is a scientific advisor to the French National Research Agency (ANR), Medical Research Council (MRC) UK, Alzheimer’s Research UK, Parkinson’s UK, European Union, Canada Foundation for Innovation, Israel Science Foundation, Swiss National Science Foundation, National Research Foundation (NRF) in Korea, Research Grants Council (RGC) in Hong Kong, Austrian Science Fund, Geneva University Hospitals Research Fund, Michael J Fox Foundation (MJFF) for Parkinson’s research, and a scientific advisory board member of the Network of European CNS Transplantation and Restoration (NECTAR), and was previously member of the European Parkinson’s transplantation trial development group (TRANSEURO). He is an active member of American Academy of Neurology, Movement Disorder Society, British Neuroscience Association, MJFF neuroinflammation consortium, Neurodegenerative Disease Research (JPND) Imaging committee, MDS Neuroimaging Study Group, MDS Non-Motor Study Group, and a Fellow of Royal Society of Medicine. Professor Politis is an Associate Editor for Frontiers in Neurology and Nature Parkinson’s Journal. At King’s College London, he teaches undergraduate and postgraduate students Neurology, Neuroimaging and Neuroscience.